JDG Associates, Ltd. has been engaged to conduct the search for the Executive Director position of the Washington, DC-based Marine Technology Society (MTS). MTS offers an opportunity to work with a dynamic, financially secure technical society representing industry, government, and academic professionals focused on global marine technology issues. The position will call on the successful candidate to facilitate international exchange on a broad range of current issues. MTS is looking for a high energy, self-starter to work with a dedicated volunteer leadership committed to significantly growing the organization’s international scope and range of services. The successful candidate will play a direct role in raising the profile of an organization dedicated to serving as the global forum for exchange in promoting awareness, understanding, advancement and application of marine technology. while promoting member success and public understanding. The Executive Director (ED) reports to the Board of Directors, primarily through the MTS President, apprising the Board on matters critical to member interests, the organization and the fulfillment of its mission. Serving as an ex officio member of the Board, the ED works to ensure the Board operates in a highly functional, efficient and effective manner. As the chief of staff officer of MTS, the position has responsibility for managing its staff and the overall execution of Board policies, including MTS’ Strategic Plan. The ED has immediate responsibility for the policies and practices necessary for the effective operation of the headquarters function and serves as a spokesperson for MTS in internal and external relations. The position supervises a full-time staff of four and an annual budget of $1.7 million. Bachelor’s degree is required, graduate degree preferred. Experience in marine technology or related field desirable but not required. Association experience, especially with a technical professional society, useful, though not required. Leadership qualities and demonstrated success at increasing membership and growth are essential. Success in strategic planning and implementation very helpful, as would be a proven track record in marketing and business plan development and execution. 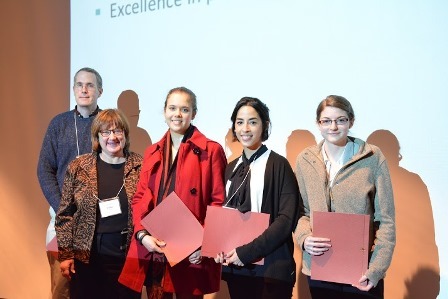 Public speaking, communications and outreach experience and success are highly desirable. Compatibles: Technological curiosity/acumen, sense of humor, multi-tasking, bridge builder, works and plays well with others, self-starter, team player, catalyst, engaging, high energy, collaborative. Our world's oceans are crowded with swirling motions called eddies. In our region they are formed by instabilities in the Caribbean current and resemble meteorological patterns we usually find in the atmosphere. Cyclonic eddies rotate counterclockwise in the Northern hemisphere, while anticyclones rotate clockwise. Eddies in the Caribbean Sea travel westward at speeds of roughly 15 to 20 cm/s, sometimes interacting with South American river plumes to trap brackish water with different salinity and temperature than their surroundings. As they travel west these huge whirlpools can potentially impact navigation, fisheries and ecosystems, as their nutrient-richer, saltier or warmer water may disrupt the business-as-usual marine dynamics. CARICOOS' new pair of high frequency radars detected the most recent eddy activity near the southwest coast of Puerto Rico. The cyclonic eddy was first detected on June 30, 2015, 52 nautical miles south of Ponce. Its location and extension compared favorably with publicly available satellite images. As it traveled west, this eddy trapped Sargasso in its core, which can also be seen in satellite images of ocean color. AVISO sea surface height anomaly showing an eddy signature southwest of Puerto Rico (available at http://www.aviso.altimetry.fr/). MODIS AFAI satellite image showing sargasso accumulation in the eddy core (from USF's Optical Oceanography Laboratory). Puerto Rico and the US Virgin Islands have been recording large amounts of Sargasso washing ashore all across. It typically drifts in a Northwestern trajectory due to the atlantic gyre resulting in large amounts accumulation, particularly in the south coasts. This kind of seaweed can sometimes cause disturbances in marine activities as it piles up in the coast, particularly in harbors or boat ramps. Boat operators, specifically PWC owners, need to be aware that Sargasso in large quantities can damage and/or shut down motors. Get to know when the next Sargasso patch will start arriving using USF Optical Oceanography Laboratory satellite images available here. Getting to know the local ocean conditions and environmental events is the key for safe marine operations. Sargasso at Parguera's Boat Ramp in Lajas, PR. MODISA AFAI image for July 25, 2015 and July 27, 2015. Surfrider-CARICOOS beach water quality monitoring program (part of the Blue Water Task Force), provides test results for enterococci presence in water samples collected once or twice a week for various popular beaches along the northwestern coast of Puerto Rico. Currently more than 19 beaches and several fresh water sites are regularly monitored by a dozen volunteers as part of this program directed by Steve Tamar, vice president of Surfrider Foundation-Rincon Chapter. Very recently Steve and CariCOOS scientist Sylvia Rodriguez-Abudo teamed up for a two-week long daily monitoring campaign at Rincon Balneario. Their findings indicate that several events of bacteria presence at Rincon Balneario were undetected by Junta de Calidad Ambiental's every-other-week monitoring program. Most of these high-bacteria events occurred after more than 15 mm of accumulated rainfall were reported, although as pointed out by Dr. Rodriguez-Abudo, nearshore hydrodynamics and biogeochemistry are likely to play a significant role in the fate and transport of potentially pathogenic organisms. These results reaffirm the need for site-specific probabilistic models of beach water quality in the region, as well as fast and affordable detection techniques. Blue Water Task Force beach water quality product. NOAA's Climate Prediction Center says the 2015 Atlantic hurricane season will likely be below-normal, but that's no reason to believe coastal areas will have it easy. CARICOOS' buoy network and wind mesonet stations provide the user with near real time data before, during and after the storm. You can also locate your house in our storm surge maps for Puerto Rico and USVI, easily exportable to Google Earth. And don't forget to check the Hurricane Season tab for several other graphical products. CARICOOS Storm Surge product interface. 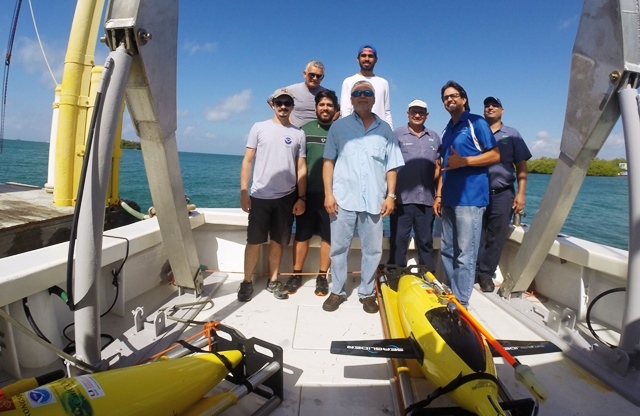 CariCOOS graduate student Luis Pomales and researcher Patricia Chardón along with Grant Rawson and Ulises Rivero from NOAA AOML deployed an ocean glider about eight nautical miles off the southern coast of PR. This deployment is part of a multi-institutional effort to improve tropical cyclone intensification forecasts in the Caribbean Sea and the Tropical North Atlantic Ocean. Data can be visualized and accessed here. After a few days of maintenance, our team successfully redeployed Rincon's Waverider buoy, the second most accessed buoy in the CariCOOS network. Located just a few miles from Rincon Lighthouse, this buoy provides ocean swell data for the west coast of the Puerto Rico. Information on wave height, direction, and period can be accessed here. Rincon Waverider buoy after cleaning and maintenance. The team retrieving the buoy for its annual maintenance. CariCOOS Executive Director Professor Julio Morell and Technical Director Dr. Miguel Canals attended the USCG search and rescue meeting last April at the US Coast Guard Office in San Juan Puerto Rico. This is one of the many sector-driven engagement efforts aimed at better serving the needs of the search and rescue forces in the region. In an effort to increase awareness of CARICOOS products and services in support of rapid response operations, CARICOOS directors Professor Morell and Dr. Canals attended the Caribbean Regional Response Team meeting in St. Thomas, USVI this past June. This initiative resulted in new and enhanced private and public collaborations towards preparedness and response to natural and anthropogenic disasters. CARICOOS leadership continues to attend the South Harbor Safety and Security meetings to engage stakeholders from the shipping and cargo industries, in an effort to sustain the commitment of CARICOOS in support port and harbor operations. This past meeting, which took place in July, focused on surveying the participants on data needs, CARICOOS asset awareness, and potential for external partnerships. CariCOOS and SeaGrant Puerto Rico continue to emphasize marine safety to our local beachgoers. In an effort to extend public awareness of the vast amount of data concerning sea conditions, CARICOOS and SeaGrant participated in the WHO'SUP Fest, a standup paddle contest that took place in Rompeolas Beach, Aguadilla on Saturday July 11th. Participants were briefed on how easy it is to plan for marine activities by accessing caricoos.org or downloading our mobile application. This is one of our many outreach activities seeking to reduce the amount of incidents attributed to hazardous sea conditions, and educate people on how to access our data. CARICOOS Outreach and Education coordinator, Dr. Sylvia Rodriguez-Abudo, DMAC coordinator Dr. Jorge Capella, and graduate student Mary Carmen Acosta visited Jobos Bay National Estuarine Research Reserve last April for their 2015 Earth Day Open House. Dr. Rodriguez-Abudo presented the elements of the observing system to elementary school students, while Ms. Acosta shared preliminary findings of an ongoing CARICOOS-JoBaNERR collaboration on water quality time series analysis. JoBaNEER is a key CARICOOS partner for future ecological forecasting efforts in the region. CARICOOS scientists and staff present major achievements and challenges in developing and maintaining an ocean observing system. Prof. Julio Morell emphasized on the particular needs of tropical islands at MTS/IEEE OCEANS'15 in Genova, Italy. In that same meeting Operations Engineer Carlos García presented the results of an ongoing thesis project seeking to asses the feasibility of wave energy in Puerto Rico and the USVI using CARICOOS operational models. Likewise Dr. Canals and Dr. Rodriguez-Abudo inaugurated the first ANAMAR's CIMO meeting this past May in the Dominican Republic, with the purpose of exploring international collaboration with the neighboring island. Professor Morell presenting at at MTS/IEEE OCEANS'15. The CARICOOS General Assembly was full of energy and enthusiasm. With record-breaking attendance, over 170 stakeholders, users, and collaborators joined CARICOOS to learn about our progress, interact with students through the poster session, and see live demonstrations of capabilities. Jorge Corredor, outgoing Council Chairman said it best - in the last 7 years CARICOOS has come from an idea to a robust presence in the NE Caribbean. "IOOS-CARICOOS is used with enthusiasm and confidence", said Dr. Walker, President of the University of Puerto Rico. He went on to say that CARICOOS' information is vital to the transportation of goods, human health, changes in climate and ecosystem, safety, and protection of our environment. Puerto Rico and US Virgin Islands Congressional Representatives (Hon. Pedro Pierluisi and Hon. Stacey Plaskett's District Director Elizabeth Centeno) also showed their support in lively and enthusiastic messages. MAYAGUEZ, PR - Members of the CARICOOS team, Puerto Rico Sea Grant, and NWS, hosted a workshop last January aiming at introducing stakeholders to the new Nearshore Breaker Height Model (NBHM) and Storm Surge Map (SSM). 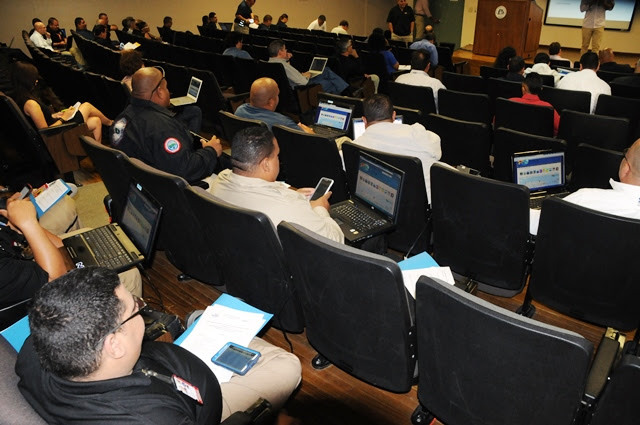 Attendees included beach managers, city/town representatives from various municipalities, Puerto Rico State Agency for Emergency and Disaster Management personnel, among others. As part of this interactive workshop, participants were primed with navigating www.caricoos.org, interpreting the graphical and tabular tools of the NBHM product, and the SSM for Puerto Rico. Participants were also briefly introduced to the science underlying each product and their associated uncertainties. The NBHM product is an effort to warn beachgoers and lifeguards of potentially dangerous breaker height levels. It provides breaker height estimates for 60 beaches in Puerto Rico and the US Virgin Islands based on the Simulating WAves Nearshore (SWAN) wave model. The SSM product is a visualization tool in support of disaster management and mitigation efforts generated by numerical computations of storm surge resulting from hurricanes of different intensities and possible tracks. For more information of the NBHM and SSM products, please contact Dr. Miguel Canals and Prof. Aurelio Mercado, respectively. 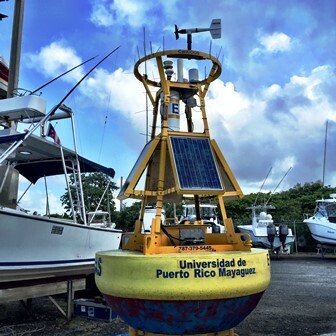 The annually scheduled maintenance operations for the St. John, San Juan and Vieques buoys have been completed and data can already be accessed at CariCOOS.org. CariCOOS data buoys (GoMOOS-type buoys) are serviced yearly and refurbished by its fabricators from the Physical Oceanography group of the University of Maine led by Dr. Neal Pettigrew. This maintenance is scheduled to ensure it’s timely completion before the hurricane season that officially begins June 1. This major operation is supported by the CariCOOS Field Team and Commercial Divers Inc ®. 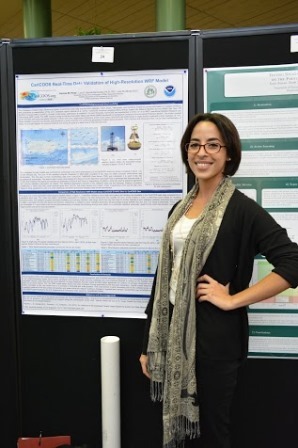 CariCOOS congratulates Dr. Aponte's student Jaynise Perez for receiving the "Excellence in Poster Presentation" Award at the APS Conference for Undergraduate Women in Physics. Her poster "CariCOOS Real-Time Data Validation of High-Resolution WRF Model" was presented this past weekend at Rutgers University.